At the beginning of June 2015, Geoff and Andy are off again. This time they’ll set off from Rosslare, County Wexford, on the south east coast of Ireland. From there they plan to paddle the 1,000 miles or so around the Irish coast. 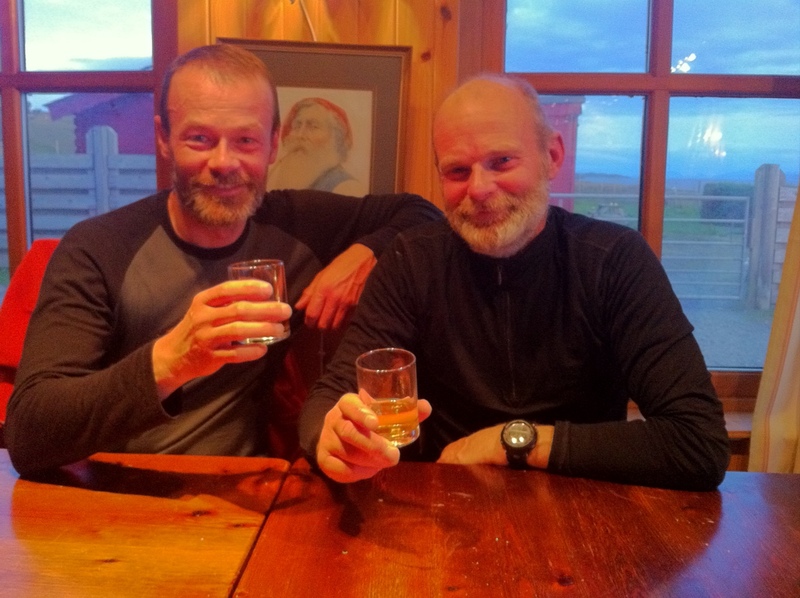 Andy and Geoff are keen to point out, there are no records in danger with this expedition, com ing as they do from the more sedate school of paddlers. Nor are they under any illusions about how tough a trip it could be with the exposed west coast and Atlantic swell. Getting all the way round is not a forgone conclusion. However, they are looking forward to experiencing what the incredible coastline of Ireland has to offer and in the process, raising some cash for a couple of their favourite charities. See our ‘Donate’ page for more details. Weather permitting, they hope to be back in Rosslare before the end of July. Big thanks to Seakayaking Cornwall for all their support and encouragement and to Kirton Kayaks for building us two fabulous C Trek 18s. At the end of April 2012, Geoff Cater, Mike Greenslade and Andy Mullins will set off in their kayaks from Tatums Beach, Portscatho on the Cornish South Coast. They’ll turn right at the harbour wall and with some hard paddling, some reasonable weather and a lot of luck, they’ll appear again on the horizon some 100 or so days later. All very keen sea kayakers, the paddlers met on the Isles of Scilly in April 2011. This is a mighty challenge – the journey has been completed by some very talented kayakers with impressive pedigrees. It has also defeated some equally talented kayakers and the team are under no illusions about how tough a physical and mental challenge this will be. Particularly given the fact that they aren’t exactly spring chickens any more – average age is 46. If the paddling doesn’t get to them the sleeping out in the open for most of the 100 nights just might! They are aiming to complete the 2,500 miles around the mainland by paddling an average of 25 miles per day. If the weather and tides are kind they’ll look to complete 30 – 35 miles to make up for the inevitable days stranded in tents waiting for the conditions to improve. They are raising money for some of their favourite charities along the way and would welcome any support you can give and help motivate the guys to complete the challenge. on July 12, 2011 at 4:08 pm | Reply Roger Snr. great stuff Andy and Tanya,,Hope it all works out well for you. That’s really generous of you! Thank you. In fact we have a place to stay on Anglesey sorted but it would be great to meet up and share a couple of beers and and pick your brains for any tips as we head up the rest of the west coast! All seems 2b well so far, may it continue. Does your gadgetry show how many miles or kms you travel each day, we would be interested to know. lovely to see your first days have gone well, video clips are fun, though you may not live the ‘waitress’ comments down for a while!! Met you at Nant Y Big. Good work men. I reflected a little on how my walk was a bit small by comparison. Thanks for the interview. I hope and pray your journey will be a blissful one. Hi Sam, good to meet you and by now you must have finished your amazing walk! Best of luck with the film and PHD. Thanks but they’re not our sunglasses. We’ve still got ours! Hi guys – we watched you launch today at North Berwick after lunch at the Rocketeer. As a recent kayaking convert I am in awe of your challenge. All the best with the rest of your journey. One question tho – what’s in the orange bags around your waists? Hi Fiona, you should have come and said hello. We always like a chat about kayaking! The orange bags are ‘throw tows’ – really good bit of kit that we use for rescues and towing. The one we use was designed by Jeff Allen an probably the best one on the market. Fortunately we haven’t had to use them on this trip! We are from Henshaw CE First School and we met you yesterday at Holy Island. We really enjoyed talking to you especially about how you actually go to the toilet when you are on your Kayaks. Thank you for your note. It was lovely to meet you all on Holy Island. What a tremendous send off you gave us too! Today we are in Newbiggin By the Sea. The RNLI Station here are very kindly looking after our kayaks for us tonight. Hope you all had a fabulous time on Holy Island. Met you guys on 9th about 6Km from Hastings. We stopped and chatted. What an inspiration you are!! I listened to Andy enthusing about some of his experiences and wished that it was me in the Explorer instead of the Easky. As we paddled away Paul said to me ‘I can almost hear your brain ticking from here Dave’. I wanted to turn to starboard and just keep going to France! Who needs to read about it when you can be told stories first hand. Thanks guys and safe paddling for the rest of your journey. P.S. The brain is still ticking loudly!! Thanks for the note. Great to meet you guys. We were both beginning to flag that morning and stopping to chat helped perk us up for the next few miles. Glad to hear your thinking of a challenge yourself. Let us know what you decide! Hi guys, great work, I attepmted the same journey last year starting in london but only got halfway, I was completely solo which slowed me down too much, once again congrats! Take our hats off to anyone that attempts this solo. Have no idea how anyone could manage it! Even half way is an incredible achievement. Thanks for your message John! Great to see that Andy is off on his travels again.. Loving the daily or sometimes twice daily updates. Tanya – I tried to email you. Please do let me know when you are over Falmouth way. Am still in Penryn. Finally got a permanent job at the Uni. Am in the middle of selling my flat in London so I can buy down here. Be lovely to meet up with you. I am very happy to pop over your way.